We want you to get the maximum satisfaction from your use of Soft Ground Banner Post and therefore it is important that you read these guidance notes carefully before setting up your Soft Ground Banner Post. Introduction Soft Ground Banner Post is a horizontal roller banner post that can be used both outdoors and indoors. The product has been designed for one day events such as sports events and fairs where transportability, quick setting up and ease of use are key considerations. The product is not designed to be left up unattended for long periods of time in all wind conditions. NOTE : It is important to assess the ground conditions, situation and wind conditions, before making a decision on how and where to set up your Soft Ground Banner Post. 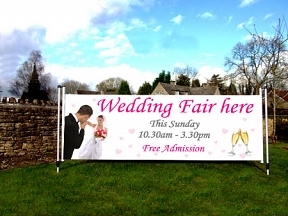 Outdoor set up in gentle breeze or sheltered situation These are the ideal conditions for Soft Ground Banner Post. Position the two posts in the preferred location and secure using the ground pegs and one set of Hi Vis guys. Please be careful to ensure that the guys are not positioned so that they present a hazard. If the ground is soft, added support can be achieved by pushing the extension poles into the ground a few inches. Outdoor set up in windy conditions or open situation Soft Ground Banner Post can be used in windy conditions up to 18MPH but extra support precautions must be taken to ensure that the set up is sturdy and safe. Firstly select as sheltered a position as possible to set up Soft Ground Banner Post. In windy conditions, consider using the recommended Zoom Lite base units on each post for added stability. These bases will add strength to the posts and stop them from being blown over. Next, secure the posts using the Hi Vis guys and pegs, ensuring that the guys are positioned with a 45 degree angle between them. This positioning will ensure that the guys both pull the banner taut and stabilise the posts.